I recently began the cover process for my second book with artist Stephen Youll. I relish working with people who are at the top in their fields — Stephen fits that bill. What really got me was his story. A number of years ago, a major publishing house came to him to take a crack at a cover for a book they were trying to bring to market. The first launch had failed, and they thought the cover had something to do with it. The publisher knew they had a great book on their hands and gave Stephen a specific direction to follow. At the time of the launch, romance novels were among the most popular, and the publisher believed that putting a romance flare on the cover of this book would help it sell. The art shown to the right is what it went to market with — and the book met with the same lackluster response as it did in its first launch. What went wrong? 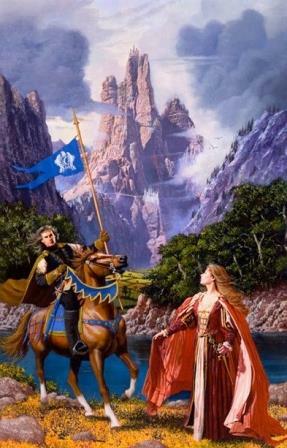 The cover art is pretty good, depicting romance, gallantry, adventure and perhaps some fantasy. The problem was that the book was Machiavellian, bristling with politics, intrigue, assassinations, and double crosses. The cover simply didn’t fit the story or meet the needs of the target audience, and, thus, it failed to take off for a second time. And the name of this book that met with such tepid response on its first two launch attempts? Game of Thrones. 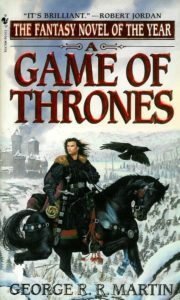 Unwilling to let such a great book fail, the publisher’s art director engaged Stephen for his ideas, and together they came up with a new concept, one that depicted Jon Snow on a horse in a snow-covered backdrop in the North — a raven ominously circles. Game of Thrones went to market for a third time with this cover (below) — and became a best seller. How Much Does a Cover Matter? I have one of those minds that always searches for answers. I inherently understood that a good cover sells, but just how much does it impact a book’s success? I needed to know, so I recently put a survey together where I asked 200 people to look at three book covers, and if that was all they had to go by, which would they choose to purchase. One of the covers was from a professionally published book, and was brilliantly done. The second was decent — not great, not bad. The third was bad, and I mean really bad. For consistency, all covers had the same name. For the second question, I added reviews to each, reversing the ratings against the quality of the cover, giving 3.5 stars to the excellent cover, 4 to the middle cover, and 4.5 to the bad cover. Lastly, I added the number of reviews to each, in addition to the rating. The excellent cover, 3.5-star book had only 12 reviews. The middle cover, 4-star book had 115, and the bad cover, 4.5-star book had 437. Take a look at the results. As you’d expect, judging a book strictly by its cover meant that the best cover won — nearly ¾ of the people said they’d purchase the awesome cover just based on this. When ratings come into play, again as you’d expect, the higher-rated books made up some ground. But still, more than half of the people chose the better cover over the two with better ratings. Then you add in the number of reviews, and the bad cover makes up a lot of ground, but even with a its low 3.5-star rating, and very low 12 reviews — a book I would never consider buying — the book with the best cover still wins over the 4.5 star book with more than 400 reviews — 41.5% to 34.1%! If that doesn’t prove that a good cover is critical, I don’t know what does. Stephen Youll is a multiple award-winning cover artist whose work has graced hard cover, trade, and mass-market paperbacks of the world’s most prestigious publishers and greatest authors. His art has been shown in the Smithsonian, the Science Fiction Museum in Seattle, and Illustration House in Manhattan. He can be found online at StephenYoull.com. 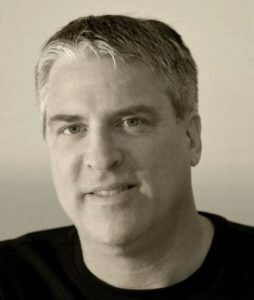 Darren Beyer is the author of Casimir Bridge, the first of the three-book Anghazi Series. He is also the creator of So You Want to Self-Publish a Novel for any self-published or new author. He can be found online at DarrenBeyer.com and his Author Central page. Ugh..I’m used to hearing that a bad cover means no visibility, but your results point to a much worse outcome than that. 🙁 Thanks for sharing your experiment. It’s been a real eye-opener. As a long time product development professional, I knew that covers mattered, but I was very surprised at the survey results. I didn’t think they would matter _that_ much. Astonishing stats! Thank you for proving that we DO judge a book by its cover. All very well, but how do we authors know when a cover is ‘good’ – ie. attractive to our reader demographic? One easy way is to post out to your social media followers and get their feedback. Another, if you have a little money to spend on it, is to do exactly what I did for this survey: use one of the online services to solicit feedback. Amazing survey. The results do not come entirely as a surprise but it sure bring home how important a great cover is. IU has posted articles on covers before, with good advice on planning a cover, But in the end I still wonder about my own. I think they’re good but are they good enough.? Hmmmm. As I mentioned above, do a survey. You could compare your potential cover for your new book to a couple from existing competing books of other authors. It costs a little money, but not much. I’m hoping to do my own cover for my WIP. A pro artist did it for my first book and the cover was brilliant and worked beautifully. It helped sell that book so well. That’s why I only say “hoping” The fact I’m prepared to put endless time into it is a big advantage. You can’t expect anyone else to do that. I paid a ‘professional’ cover designer to design the cover for my last book. It was so out of context with the actual book I didn’t quite know what to do with it. I reverted to my previous editor and book cover designer and came up with something at least fitting if not brilliant. Cover design is one of the hardest to crack. It’s so personal. When that happens, can you get your money back if the cover is unusable? Or at least part of it? Would a cover designer be required to read the book in order to get a feel for the kind of design needed. How else could they get it right? Most artists should split their fee so that some is paid up front, possibly some in the middle, and the balance at completion. If an artist delivers something that is so far away from your desires that it’s unusable, then keep asking for something different until you get something you’re happy with. If that doesn’t happen, then you can go with someone else, but at least you’re not out the entire fee. I devote an enormous amount of time to finding exactly the right covers for my books–to me, it’s an essential part of the creative process, an aspect I’d never want to surrender to anyone else. My books have won praise for their “look” and I always get an excellent reaction from bookstore managers when I show them samples of my titles–never fail to get my books stocked in any store I’ve approached. I just checked out your covers Cliff and they are amazing and very unusual. It’s very reassuring to me to discover through you, that yes, an author IS capable of creating the right look for their own book. Thanks for taking the time to look over my books. Indie life: it has its drawbacks, but it has its rewards, as well.